There are some major 3D printing trade shows that cover all or most aspects of the industry, and then there are more niche events that focus on a smaller area – like last week’s summit on 3D printing in medicine and dentistry, for example. Coming up next week, on February 8 and 9, following SOLIDWORKS World, is the Formlabs Roadshow in Los Angeles, and its focus is on another piece of the industry – design and entertainment. To be exact, the theme of February 8’s agenda is Design and Manufacturing, while February 9 covers Entertainment and 3D Printing. The panel and networking event will, on the first day, discuss the digital workflows of small and large manufacturing companies in Los Angeles. Engineering and design firms will talk about how to optimize manufacturing processes for production by incorporating 3D printing into workflows. On Day 2, industry-leading character artists, game designers, and special effects artists will discuss how they are using CAD and 3D printing to rapidly prototype their designs. Design experts will talk about how they combine traditional techniques and new technology to bring their designs to life. Highlights of the Design and Manufacturing segment will include an expert discussion on the intersection of design and manufacturing, and how designers become manufacturers and manufacturers become designers. They will see the workflow of Matt Moseman of the custom auto shop Ringbrothers utilize the Form 2 and SOLIDWORKS to create end-use parts such as door handles and mirrors. In the Entertainment and 3D Printing segment, attendees will hear from Aaron Sims of Aaron Sims Creative and see how they used Wacom, Zbrush and the Form 2 to bring the Demogorgon from Stranger Things to life. Tickets to the Roadshow are $5, but if you’d like a complimentary ticket, you can use the code 3DPrint.com to attend for free. Will you be attending? 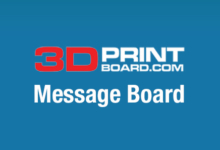 Let us know at 3DPrintBoard.com or below.